Lemon Garlic Herb Grilled Salmon has such a bright, fresh flavor and its absolutely perfect for summer! Because hello grilling season. It’s easy to make, and only requires a brief marinating and quick grill time. 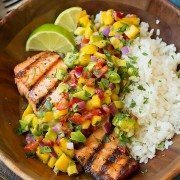 With flavor like this it will likely become a go-to grilled salmon recipe! I grill a LOT of food in the summer. Most commonly it’s chicken and salmon so I’m always trying new ways to prep it with different flavors. 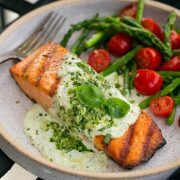 The lemon salmon combo is one of my favorites and of course I love the addition of garlic and herbs so here we are with this blend in oh so tasty recipe! 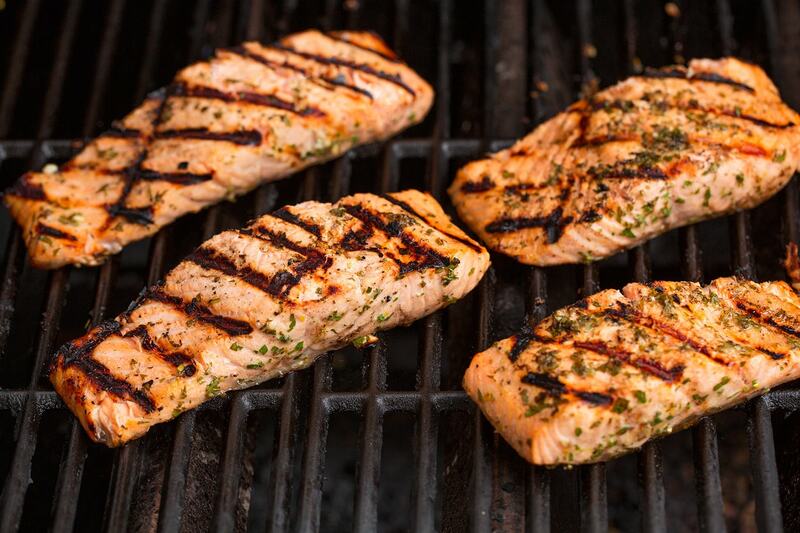 If you aren’t familiar with grilling salmon here’s some tips to get you started. First of all pick the right salmon. The thinner fillets won’t work well for grilling. Look for a side of salmon or fillets that are at least 1 to 1 1/2-inches thick. You can grill skin-on or skinless salmon but when I’m marinating I like to skin them so the flavor will soak into both sides. If you grill skin-on it will actually peel away easily after being cooked so keep that in mind for a different recipe. If you don’t know how to skin a salmon fillet you can ask your butcher and often they’ll do it for you, if not there are plenty of Youtube videos that show how. 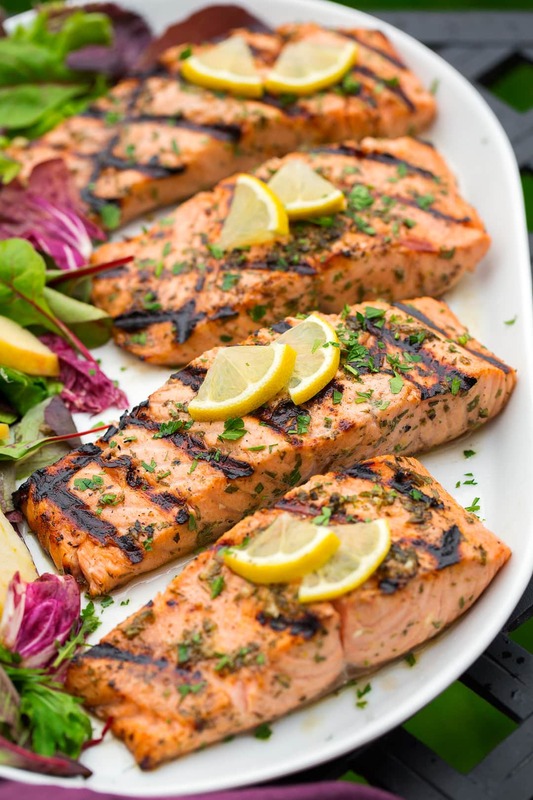 Don’t marinade salmon longer than 30 minutes if it contains an acid ingredient (i.e. lemon juice, vinegar, wine, mustard, etc). After that it will start to alter the texture of the salmon. Always preheat the grill, don’t start out with a cold grill. I like to use a medium-high heat. Preheating usually takes about 5 – 10 minutes, or more on cold days. Clean grates with a grill cleaning brush, then brush grates lightly with oil (vegetable oil or olive oil) so salmon doesn’t stick. Add salmon, giving space between fillets then close grill lid and grill salmon carefully turning once halfway through, until cooked through, about 3 – 5 minutes per side. Note that cook time will vary based on thickness of fillets and how you like them cooked, a bit of darker pink in the center is fine. First you’ll whisk together the marinade ingredients in a bowl. Place the salmon fillets in a shallow dish just large enough to fit the salmon then pour marinade over. Cover and refrigerate 30 minutes carefully turning once halfway through. Preheat a grill during the last 5 – 10 minutes of salmon marinating. 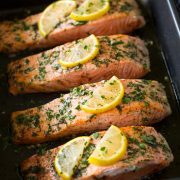 Clean grates and brush with oil then place salmon on grill and cook about 3 – 5 minutes per side. A little bit of the pink in the center is fine if, that’s how you prefer it cooked. Serve warm garnished with parsley and decorate with mini lemon slices if you’re into that kind of thing. Are you hungry now?? I know I am and now I need to add them to the menu again next week! 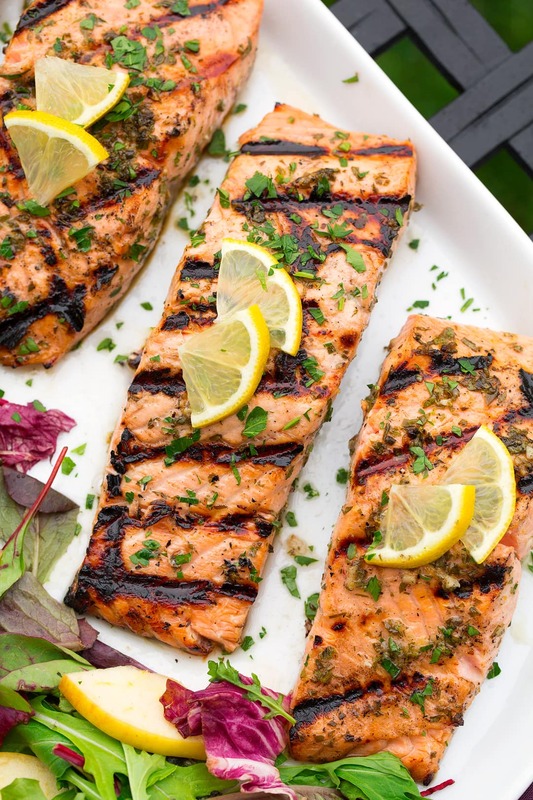 This salmon is marinated in a bright, fresh lemon garlic herb marinade then grilled to perfection. It's such a delicious and refreshing salmon recipe and it's perfect for summer! 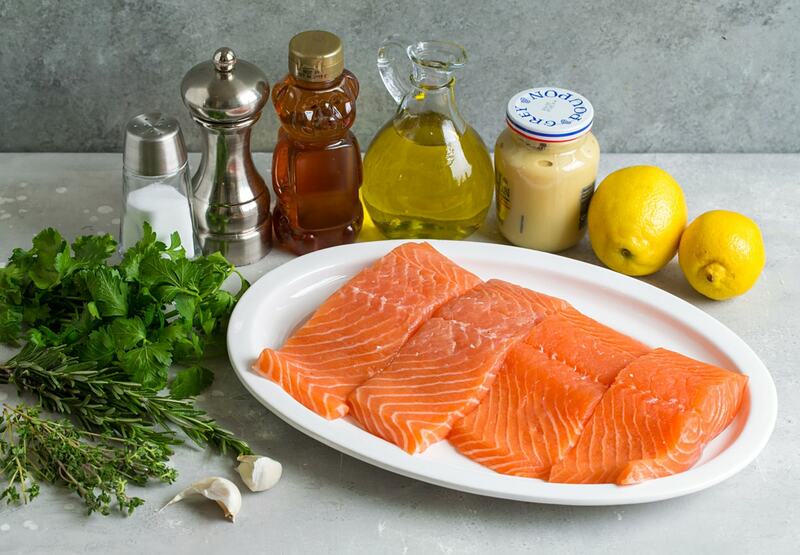 Place salmon in an 11 by 7-inch dish. 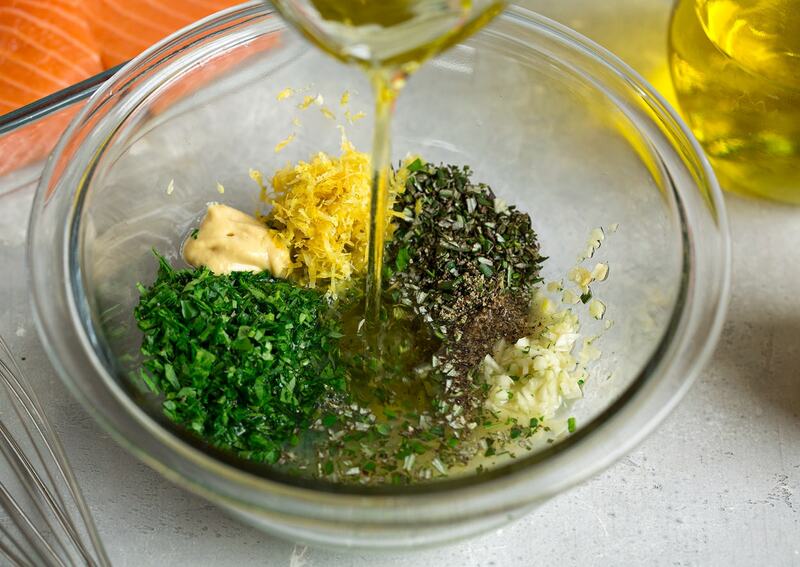 In a small mixing bowl whisk together lemon juice, olive oil, parsley, rosemary, thyme, garlic, lemon zest, dijon mustard, honey, 1 tsp salt and 1/2 tsp pepper until well combined. Pour mixture over salmon (lift fillets to help marinade run under) then cover and let marinate in refrigerator 30 minutes, turning once halfway through. Preheat grill to medium-high heat during last 10 minutes of salmon marinating. 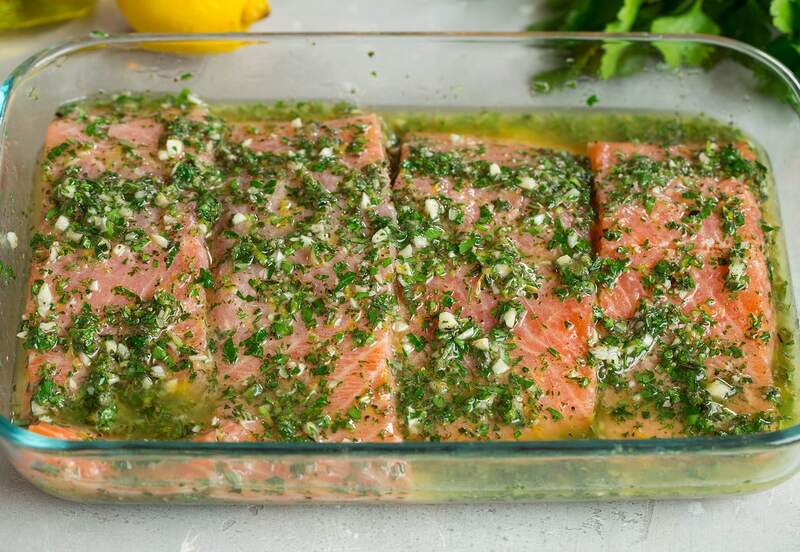 Brush grill grates with oil, spoon some of the herbs onto salmon (or just use your hands to spread them over), remove salmon from marinade and place on grill. Grill about 3 - 5 minutes per side to cook through. Serve warm garnished with more parsley if desired.